If you cast your mind back a month or so you may recall that mischievous bookmakers Paddy Power invoked the Chelsea legal department’s wrath by slapping up a billboard outside Stamford Bridge which poked pun at a certain chap by the name of Fernando and his lack of goals by pointing the way to “the onion bag”. After calling in the lawyers, Chelsea eventually won the right to have the billboard pulled down after the local council agreed that the advert directly impinged Torres’ image rights. The council then had the advert removed from the wall of a shop directly opposite Stamford Bridge’s Britannia Gate. 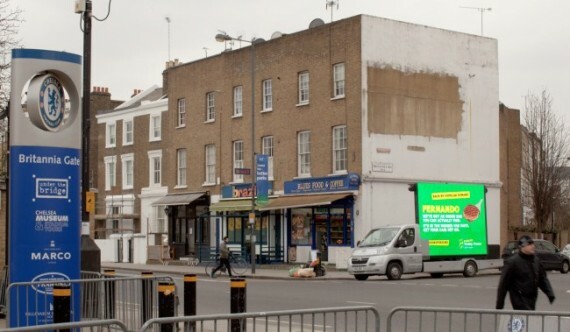 However, as if it wasn’t crappy enough the first time round, just days after the advert was removed, perennial japesters Paddy Power flaunted the ruling by turning up in a truck with a digital wall on the back displaying – guess what? – that same bloody, crushingly unfunny advert and parking right under the space where the original billboard was pasted. Oh the hilarity! Here’s hoping they get a sizeable ticket for parking that damn contraption so close to a junction. There is nothing as unfunny in the world as corporations trying to be “edgy”. Their little “boxer shorts”-stunt with Nicklas Bendtner during the EC cost him a suspension in a game where he was sorely needed. Agree, can’t stand Paddy Power – cheap, tacky, attention whores, never funny. Wouldn’t give ’em a cent. So, while deriding them for their marketing ploys, you give them the exposure that said advertising tactics thrive on. Very clever! @Doctors Your Uncle: The only place Bendtner is sorely needed is s hot air balloon, in order to keep it afloat. Denmark should do much better.